Traditional varieties are grown which are long-stemmed and hollow walled. 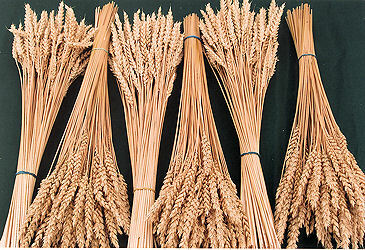 -Maris Widgeon: A thin walled, pale straw with large white ears. The straw is of medium length, (16 inches/42cm) and is the most popular variety. Golden ears are good for decoration and floral displays, whilst the straw can be used for marquetry. Oat straw is also suitable for making Orkney chairs. The straw is long and hollow. The straw between the second and third nodes are quite long and thick which makes them suitable for straw marquetry. 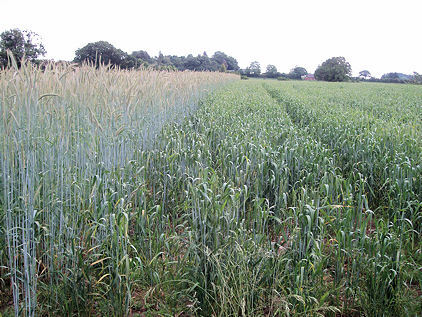 As the rye is so tall (as you can see in the photograph below) it is cut by hand whilst it is still green and then dried. This picture is of our rye and wheat field. The rye is the tall crop on the left. Prepared straws can be purchased in any denomination of 100, right up to several thousands. Prepared straws are the length from the ear, to the first joint/node. A pack of straws make ideal gifts for crafts enthusiasts. Prepared straws are not graded so each bundle contains a selection of thin, medium and thick straws. These all have ears unless you specifically request them without. Remember before you plait with the straw you need to dampen it otherwise it will break. For best results immerse it in hot water for 30-45 minutes or until it is pliable, then wrap it in a damp towel. It is best to use your dampened straw within 24 hours. I can only accept payment as a cheque or postal order. Cheques should be made out to H. R. Sault. Please do not make cheques payable to ‘Simply Straw’. If you want to collect straw from the farm please contact me to arrange a time and for directions. Please note no straw is kept at the above address. For deliveries by post allow 7 days for the Post Office to deliver it. This material on these pages (text and graphics) is owned, held or licensed by Rosemary Sault. Copyright of photographs on these pages is retained by Rosemary Sault or the owner where acknowledged. Any use, including commercial reuse, mounting on other systems, or other forms of redistribution requires the permission of Rosemary Sault. This page was updated on 3rd August 2016.